Creative Smiles, Inc. is a premier dental laboratory that takes great pride in creating beautiful artistry and functional dental restorations. From the moment our patient's cases arrive, each one is given the utmost attention. We firmly believe in a philosophy that it starts from the foundation up. Our model work is second to none, utilizing the finest materials on the market to assure the best fit at cementation. Once the foundation has been established the artistry between dentist and laboratory begins. Each case is given the ultimate respect and attention to detail, resulting in the finest life like restorations. Creative Smiles, Inc. is consistently keeping up-to-date with the latest technologies and we consider ourselves to be a valuable resource for discussing the varied types of restorations available in this ever-changing industry. We truly enjoy sharing our knowledge with the dentist and their staff. We firmly believe that communication, outstanding quality and unmatched service is what sets us apart. We strive on becoming an important part of your dental team. I have been working with Creative Smiles and Javier Luna for well over ten years. The cases that I have received from Creative Smiles have always been in the "elite" category of fit, contour, morphology and esthetic appeal. 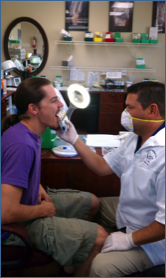 Javier Luna is a "master" technician who always delivers the finest quality restorations in a very professional manner. I often use Javier's expert abilities in shade determination through in-lab or in-office custom shading sessions. His ability to create restorations with unparalleled esthetic results coupled with his superior skills of margin adaptation and finishing combine to make him the premier fixed prosthodontic laboratory technician in this area. I would not send my cases to anyone else. I am extremely impressed with the Veneers your lab created. The quality is exceptional. The Veneers are identical to the teeth they replaced/enhanced. Javier Luna took the time to meet with me in person and address any questions or concerns I had. He accurately matched the color, size, shape and thickness to my other teeth. He is truly gifted and skilled. Thank you very much for the fantastic Veneers. Creative Smiles raises the bar with life like restorations you and your patient expect.